It's important to keep track of your projects’ time, expenses and invoicing. Here are three apps that could help. Now that tax time for 2015 is over, it's time to think about preparing for 2016 -- especially if you're an independent worker. While the full-time job market for IT workers is, according to many industry workers, quite healthy, there are also those who choose the freelance life, either through necessity or preference. However, whether they operate under contract or job-by-job, there is at least one thing that most independent workers have in common: The need to deal with the business side of freelance work. If you're an independent worker, chores like tallying up hours for several (possibly simultaneous) projects, adding up expenses and generating invoices are all tedious and time-consuming -- but necessary. And while you probably don't need the advanced features of a full business financial package, you can't make do with personal financial software either. You need an application that addresses your specific business model, that's easy to learn and use and, ideally, able to integrate with major accounting and tax prep software. Here are three packages that might meet your needs. Invoice2go is a Web-based software as a service (SaaS) product that gives contractors and freelancers a way to create invoices, estimates, purchase orders and credit memos from a mobile device (iOS or Android) or any desktop/laptop computer. It also provides reports with graphs of the overall state of your receivables and offers users a means of receiving payment via credit cards. Once you have created your boilerplate company info, Invoice2go streamlines the invoice process, a vast improvement on, say, simply using your word processor. Besides keeping copies of your invoices, the application gives you payment status data -- including whether an invoice has been paid or not -- in its dashboard. Invoice2go gives you a way to invoice clients quickly and on the fly. I tested the free trial version, which lets you create three free documents without having to fork over any money -- not a generous trial, but enough to get the basic idea of whether it works. I tried both the Web and the iOS versions; the latter has the same look and feel as the former. But the iOS version could use more space between task selection icons, which are pretty closely spaced, making it harder for folks with larger fingers to accurately move between selections. The Starter package costs $9/year and allows one user up to 50 invoices/month. There is also a $49/year Pro version that allows one user unlimited invoices. The Pro version throws in added value in the form of Apps2go, a group of integrated apps that includes Calendar2go, which allows you to log time; Statements2go, which lets you send customer statements; Receipts2go, which helps you track expenses; and others. Finally, a $74/year Enterprise version offers unlimited invoices for up to five users, with the option to add more users for an additional fee. Creating an account was as simple as plugging in my email address and company name. Invoice2go immediately prompted me to choose one of six template styles for my invoices. I like that one of the design elements within the template styles includes several background images tailored to different types of work that an independent contractor might be involved in. The user interface is fairly straightforward; however, it was slow and actually crashed at one point while I was generating an invoice. (I had better luck generating the second invoice.) Invoice2go initially opens a generic boilerplate invoice in which you drop in dates, terms and work billed for; you can also drop in receipts and time imported from Calendar2go, Statement2go and Receipts2go. Your chosen template style and design are applied after you save the file. There are several things to like about Invoice2go. It gives you a way to invoice clients quickly and on the fly. You can generate estimates, purchase orders and credit memos from your phone, tablet or desktop. The app also provides reports on income and invoice status, so you can quickly see which of your clients are in good standing and which are deadbeats. You can view the customization options and configure the app for your needs by using the Settings directory at the bottom of the vertical navigation menu. In addition to the document template and overall style selections, it supports several languages and forms of currency, depending on what country you reside in, and offers the option of adding a watermark. Knowledge Base, FAQ and Help sections are helpful in answering questions if you need guidance. Data is synced every time the app is used -- provided you've saved by clicking on the Save button in the upper right-hand corner of the invoice you generated. Invoice2go is a quick and efficient way to invoice clients and keep track of receivables. It doesn't have the accounting capabilities that QuickBooks Self-Employed does, nor does it integrate easily with other major accounting products. I'd like to see a time-tracking functionality in the basic startup package, a faster website and more user-friendly iOS mobile app, but overall it's worth taking a good look at. Productive Monkey Ltd.'s OfficeTime is a time-tracking, expense-keeping and invoice-generating application for freelancers and self-employed contractors. It's not cloud-based, but is available for both Windows and Mac computers, and there is a free 21-day trial available to users to decide whether it meets their needs. If you like it, it'll cost you $47 for either version; this includes one free major upgrade. I downloaded the Mac version of the software to a MacBook Pro running Yosemite. OfficeTime is based on a system of projects, categories, line items and a timer. The install went off without a hitch. The user interface is basic and somewhat dated in design, but since it's meant to function in the background, it doesn't need to be flashy as long as it does its job well. And it does. OfficeTime is based on a system of projects, categories, line items and a timer. A line item is a task and/or activity; you start the time (displayed as a red button) when you start working on that task. The timer will continue to run until you press the button again. Categories designate what type of line item is being performed -- for example, you can categorize something as editing, programming or project management -- with its associated hourly rate. The line items can then be billable to a single project, or separate projects. As a result, it's worth spending time setting up your projects and categories ahead of time and running a few tests. OfficeTime offers several standard category functions such as Admin, Meeting and Design, as well as the option for you to customize and assign different pay rates to each. You can also simply set up a project and then add line items to it, categorizing it as you go. You can generate customized Quick Reports of projects, which can be exported as text files for invoicing. When it's time to invoice, you create a boilerplate and its design using OfficeTime's Quick Invoice Generator, which prompts you to designate whom the invoice is going to. It can integrate with contact managers such as iContacts, Google Calendar and Outlook, allowing you to go straight to your contact base to pull in a customer's data. You can also manually enter your clients' contact information. 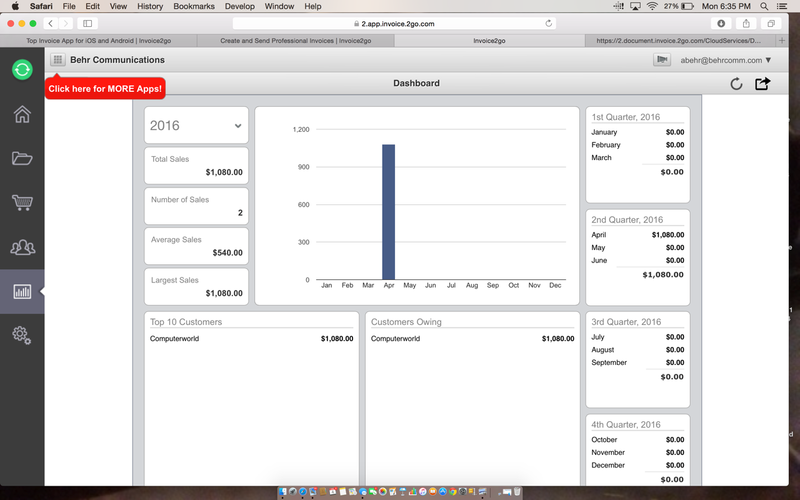 The data invoiced for is the data that shows on the Quick Report. If you need to change the data, you'll have to go back and change it in the Quick Report. OfficeTime has a number of handy features. For example, if you forget to stop the timer on a task, the next time the app senses activity, it will alert you that it had been timing for whatever amount of time it was passive, and ask whether you want to keep that time. Also, if you start the timer on another line item, it will pause the active timer, preventing you from inadvertently double-billing a client. 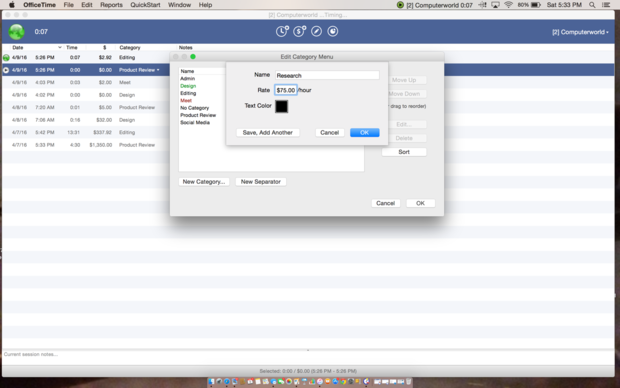 The timer integrates with Apple iCalendar, Microsoft Outlook and other leading calendars. OfficeTime is a capable solution and functions well as advertised. It's handy in that it records time as you go, negating the possibility of spending time that's not logged, and provides a means of invoicing for it. However, it doesn't integrate with any leading accounting software for tax preparation purposes or expense account tracking software. Intuit makes several versions of its QuickBooks accounting software, including iterations for enterprise, SMB, retail e-commerce and a few other verticals. QuickBooks Self-Employed is cloud-based, specifically tailored to independent contractor requirements and reasonably priced -- at time of this writing, it cost $4.99/month. You can also sign up for TurboTax for $12.99/month on the QuickBooks site. QuickBooks Self-Employed is a Web-based application with apps for Android and iOS. The user interface is clean and intuitive. A vertical navigational column containing Home, Transactions, Miles, Taxes and Reports options runs down the left-hand side of the page. 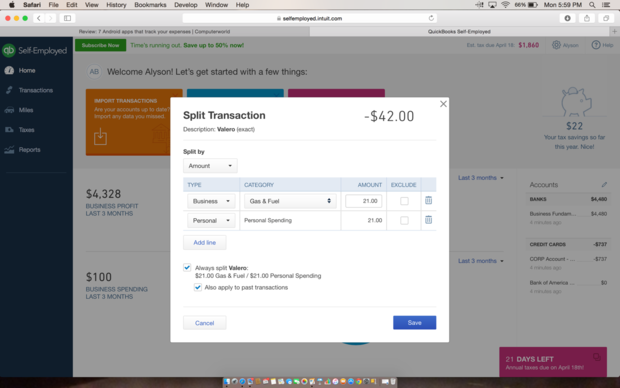 QuickBooks Self-Employed makes it easy to split business expenses from personal spending within a single bank account. Across the top of the page you'll find, first and foremost, the estimated taxes-owed figure (so you don't forget Uncle Sam). The user profile is next and separates into subsections for transactions, taxes and actual profile information. Last is a help icon that contains a knowledge base and an email contact form. The Home dashboard presents a logical information flow, prompting you to identify recent transactions first and then presenting you with your quarterly estimated tax burden. Below the tasks is an overview of your business's year-to-date profits and spending, and on the right-hand side of the page are bank accounts with balances. Getting up to speed involves connecting the app to your bank accounts from a list of the leading U.S. and Canadian banks. You can choose to have the application automatically import your transactions for the past 90 days; to add transactions from further back, you have to download and import a .CSV file. You can also, if you wish, manually input your transactions. QuickBooks Self-Employed helps contractors set up their financial transactions to make things easier at tax time by aligning each transaction with an IRS-approved expense or income category as closely as it can, given the support data users feed it. For example, its transaction list is displayed in a way that makes it easy to split business expenses from personal spending within a single bank account. The software does a good job of anticipating what IRS expense category a transaction belongs under; it gave me two ways to split a transaction -- by amount or percentage. One expense that contractors and freelancers sometimes overlook is the amount of miles they rack up for their business. QuickBooks makes it hard to ignore this, with a section and a downloadable mobile smartphone app that tracks trips and mileage. I input standard vehicle information into the Web interface and downloaded the Apple version for my iPhone. Once it is set up, 54 cents per mile clocks into your tax-deduction side without your having to think about it. You can also designate whether it's personal or business mileage. Paying quarterly (and annual) taxes can be painful if you wait until just before the due date to calculate them. QuickBooks Self-Employed is all about making sure you know how much you owe, and when they are due. There is a floating banner on the Home dashboard warning you of the deadline and giving you the number of days you have to get everything together. And if you miss that, your amount owed is shown at the top of your dash. Provided you have input all transactions and their categorization is accurate, the estimated tax figure QuickBooks gives you should be accurate. You can even choose to have them paid via the application (assuming you've upgraded and have TurboTax as well). QuickBooks Self-Employed is a capable SaaS solution when it comes to processing and understanding a freelancer's income/expense landscape and tax liability picture from financial institution accounts. While it's not a tax preparation application, it does integrate with Intuit's TurboTax, which makes it even simpler to calculate, prepare and pay. It's also not a complete solution for independent contractors because it's not able to track hours, generate invoices or provide reports on receivables. That said, its reasonable pricing allows for room to add a solution that does. All three applications -- Invoice2go, OfficeTime and QuickBook Self-Employed -- perform slightly different functions with some overlap. OfficeTime can invoice and is the only application of the three that has a timer; however, it has a steeper learning curve than the other two. Invoice2go has great document creation and receivables insight, but doesn't integrate with any major accounting software. QuickBooks Self-Employed is a fine accounting product that separates business from personal expenses and integrates with TurboTax. None of them is an end-to-end solution, but they're all affordable, giving you the option of going with one or using a couple to round out your needs.